This is a conversation with the Prince of the Ubud Royal family who has spoken at length about the Balinese way of constructing homes. Often expats have fallen foul of the religious and social norms while building due to ignorance of the customs that are intrinsic to the Balinese way of living in harmony with their surroundings. I met Tjokkorda Raka Kerthyasa at his residence next to Ibah, a sprawling luxury hotel owned by him to talk about the meaning of Asta Kosala Kosali. This is what he had to say. “It is a system…traditional Balinese method of how to divide a space for a house or temple in relation to the owner. We believe in the interconnection between macro and micro cosmos. We have a philosophy of life during transit on this planet on how to maintain harmony between human-to-human, human to the environment and human to their God. Every Balinese activity is to manifest this philosophy. So when we are building a house or temple we measure the space according to the owner that reasonates as the fundamental belief of Tatwa Philosophy, ethic and moral. There is a ritual and spiritual aspect to this…the physical world and the non physical world. Like Desa Kala Patra – Desa is a place, Kala the time and Patra the situation and condition. So when building a place anywhere in Bali it is essential to take this into account as Bali is very complex and each area has ethnic differences. For instance, Ubud and Seminyak. Here are basic simple steps to follow to keep the balance between the physical and non-physical world and to make your home one of peace, happiness and prosperity. 01. When you have decided to invest in a piece of land meet the Heads of the village of that area which is the Klian Banjar and the Klian Adat. 02. The Klian Banjar is where the legal formalities are done and where your status in the community is written decided etc. The Klian Banjar scrutinises all legal papers to ensure all are in order. 03. The Klian Adat is religious head who will advise and guide you on the rituals that need to be followed prior to commencing construction, the floor plan and most important whether the land is suitable of living on as some places are considered “bad” e.g. a house situated at a T junction or land that was formerly a cemetery. It is suggested that you concult the villagers in the area to check if the land is “good”. 04. The position of the land is not important but when you build a house and or temple it has to be recognised where the East or the North. The temple has to be positioned in the North East and the house facing usually south. The head of your bed has to facing east or North. The land must have sufficient morning and evening sun. 05. Proportions of the layout of the floor plan for the land are based on the concept of Trianga, which are head, body and legs of the owner. 06. The buildings on your land will have to be measured by human feet. In fact the measurement is done using the actual feet size of the owner! After every seven feet a half-foot is added which is called the Urip. Urip means life or living. If we don’t have space like Urip we will not have a spirit and therefore no breathe of life. 07. Once you have purchased the land the first thing to do is to follow the local customs and religious ceremonies to bless the land and construct the temple, which must be the first building on the site. We have to bury Panch Datu (Five elements), which is gold, silver, iron and ruby as they represent our body and the micro cosmos. Our material base is related to the same elements that are Earth (gold), Water (iron), Fire (copper), Air (silver), Ether (ruby). You probably are aware that we are made from Butha (character of wood), Kala (animal instinct) and Dewa (Gods and Goddesses). Only in Bali do people bury these precious materials but others mine it. The five elements vibrate life and that’s why people feel at home in Bali. Just a word of caution here: the temple or Padma Sana must be venerated according the Balinese way of life like making regular floral offerings etc. The neighbours must have access to the Padma Sana to place their offerings. Do not dissuade or prevent them from doing so. 08. Once the land has been blessed and the Padma Sana installed the first phase is complete. Now the measurements of the building is done using the owner’s feet size, outstretched arms and hands on the hip! Yes, have you ever wondered why the Balinese doors to the entrance to their homes are so narrow? Well the measurement is done of the width of the owner with his hands on his hips – elbow to elbow. 09. To tune into the “harmonious vibrations” one must consult the expert who is called Undagi. 10. The most important ceremony once the construction is complete is making it alive with rituals performed by holy men. This is symbolic of giving life to the building and thus creating a living being. It is for this reason that every house in Bali has a shrine or Padma Sana because it is a part of the owner; The building and the owner become one. After a nice cuppa tea and some fried banana fritters, Tjokorda Raka Kerthyasa, took me to the palace and then onto Pura Taman kemuda Saraswati, the Lotus Temple built by his father Tjkorda Ngurah and Gusti Nyoman Lempad, a short distance away. To begin explaining the intricate details of layout, ornamentation and aesthetics will take up a thousand pages. What you have to keep in mind is that Bali is a very special place where the Gods and Goddesses of the land hold sway over the immortals. You have to abide by the rules, rituals and pay obeisance to them otherwise your home here will never be a home. It will probably be a place that will cause you much unhappiness. This is not superstition but common sense. Living in harmony with your surroundings is an integral aspect of fine living. “Wherever you stand up, you are holding the sky above your head”. Not too long ago while driving past Opera Warung in Ubud I overhead music that was contagious and provoking. Hence, I dropped in, ordered a whisky sour and sat down to see and hear a truly gifted Balinese musician, I Wayan Balawan, in a melodic frenzy with fingers racing across the fret boards of two guitars! This is what I would call an ambidextrous musician! When the show ended I got to speak to Balawan. I Wayan Balawan hails from Batuan Village about 10 km south of Ubud. His brother owns the Opera Warung where he performs on a weekly basis to an ever-growing number of expats, people from Jakarta and locals. 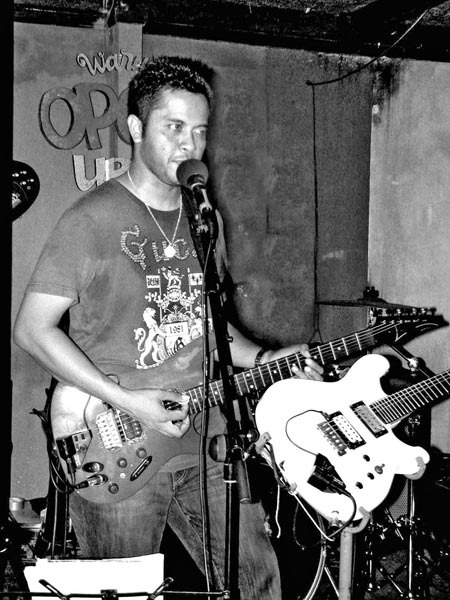 For the last 25 years Balawan has been perfecting his art of playing two guitars (electric guitar and keyboard guitar) at the same time backed by a drummer, bassist, rhythm guitarist and Gamelan. He has been attempting to bridge the gap between western music and the Gamelan. At age 11 he performed for the first time in Denpasar to an appreciative audience. A self taught musician he believes that the root of all music stems from religious encounters with the Almighty that sows the seeds of enlightenment for the artist through the music that is being played. The three musicians who have influenced Balawan’s style are John McLaughlin, Paco de Lucia and Charlie Parker. They infused in him a sense of being in touch with a spiritual force that magnified his perception of a bridge that exists in the music of eastern and western cultures. From here he began experimenting with his own compositions and came up with quite a few recordings viz. Balawan Globalism, Balawan Solo and the latest album – Balawan Magic Fingers. He has toured cities in Australia, Germany, Holland, Norway, Belgium, Japan and Canada playing his own compositions punctuated by the gamelan. Balawan’s band, Batuan Ethnic Fusion was formed in mid 1997 with the purpose of exploring existing elements in ethnic Balinese music by using a combination of western and traditional instruments (Gamelan) and to preserve for posterity traditional Balinese songs. In addition to the two guitars he plays, a bassist, rhythm guitarist and drummer he has two Balinese Kendangs, one metal Gamelan, one wooden Gamelan, one standard Cengceng, four pairs of Cengceng, four flutes and a ten-piece Reong. It’s a simple life for the Balinese” is a stanza from one of his compositions. “I am a Balinese Hindu. Life is hard enough so why will I leave my religion. It’s my life, my culture. If I wasn’t a Hindu who will carry my body to the city?” said Balawan to me, adding, “I want to tell people not to sell their land and to keep the rice fields. For if the rice fields are sold off Balinese culture and what it stands for will also slowly disappear. We have to be careful. The only way to preserve Bali is to educate the people. For without education there can be no enlightenment”. Well you heard it from a legend in the making. A young talented Balinese musician with a mission to bridge the gap between cultures and religions in a world ravaged by war, disease and racism. Come to Ubud and listen to Balawan’s music and when you do you will then believe what some have been saying – that Ubud is the cultural capital of Indonesia. Morganics – Hip Hop is my passport! 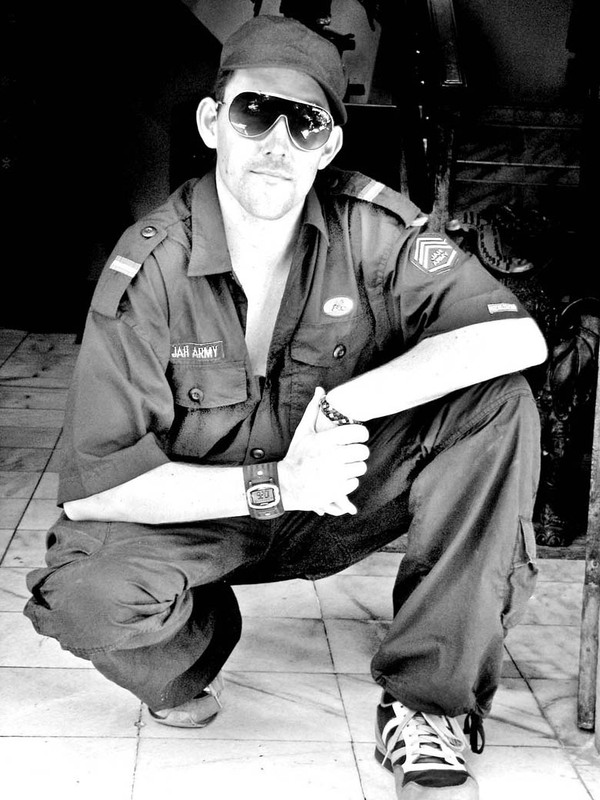 ‘It’s the seams, it’s the edges where worlds meet, old school, new school, can you feel the heat?- Rapper Morganics in Ubud! The New Year sun is days away, hiding far behind the hills of Ubud ready to rise and shine to warm, caress and preserve the beauty of a land reminiscent of the fabled Camelot. It will spread before us like a feast at Galungan and once again we will waltz through the year in Ubud rubbing shoulders with royalty, holy men, artists of vibrant hues, culinary maestros, musicians and the ubiquitous stereotype expats who lounge around watering holes wallowing in Draught. The week began with a Hip Hop cool dude, Morganics, from Down under who is here for a brief R & R with his beautiful girl friend Karina from Paris before returning to Sydney for the launch of his latest album Hip Hop is My Passport. Morganics was born in Brisbane. His father a left wing political activist introduced him to the Warumpy Band and Kraftwerk while his mother, a feminist and into street theatre, made him listen to Grace Jones and Prince’s early work. When Morganics was 13, Hip Hop culture was taking root in Oz. And like punk music it was revolutionary, political and inventing itself at every stage. He had been in television from an early age doing shows with Lee Majors on one of the popular TV series produced by NBC called Danger Down Under. Around ’95 he co-formed one of Australia’s first Hip Hop groups “MetalBass’n’Breath” with Baba Israel (New York) and Elf Tranz Porter (Houston). The 3-member band formed on the streets of Sydney rapping, playing drums and break dancing. It expanded to include Funk Jazz musicians and a DJ. Exclusive interview with Mark Ulyseas in Bali. 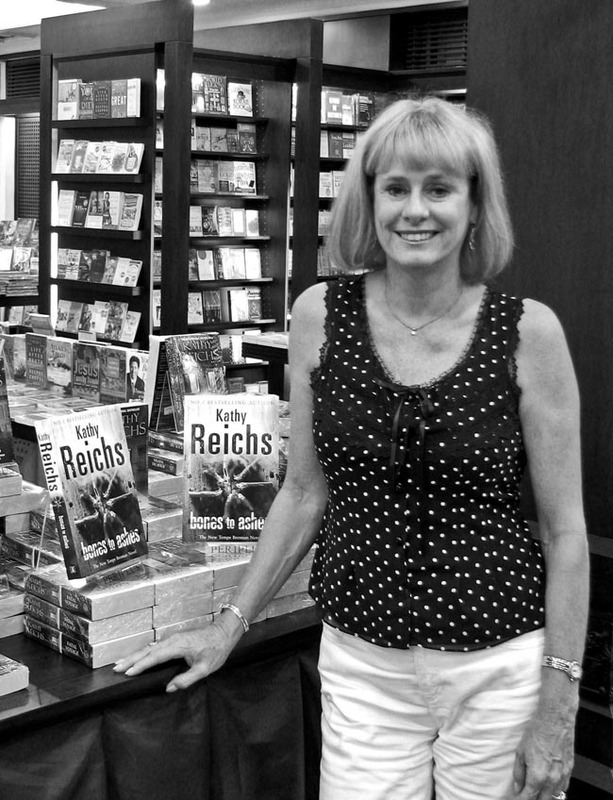 Dr. Kathy Reichs – a prolific writer whose books have all been on the New York Times Bestseller List. In fact her latest novel Bones to Ashes knocked J.K.Rowling’s Harry Potter off the top spot. She is a forensic anthropologist for the Office of the Chief Medical Examiner, State of North Carolina and for the Laboratory of Science for the province of Quebec. Kathy is one of only fifty forensic anthropologists certified by the American Board of Forensic Anthropology and is on the Board of Directors of the American Academy of Forensic Sciences; a professor of anthropology at The University of North Carolina at Charlotte. A native of Chicago where she received her Ph.D at North Western Kathy now divides her time between Charlotte and Montreal and is a frequent expert witness in criminal trials. Why are people fascinated by crime, especially murder? People have a macabre interest in the ultimate crime, triumph of good over evil, puzzle solving and seeing order restored. Is there a particular segment of the reading market that’s more interested in this area than other, say middle-aged people? The primary segment is middle-aged women probably those in their late thirties early forties. The secondary has people of all ages. What is it about forensics that attracts you? I think it’s the relevance of the scientific process that ultimately reaches a proven conclusion. It actually impacts someone’s life. It also scientifically unravels the mystery of a murder and proves beyond all-reasonable doubt thus helping the police catch the perpetuator/s. What percentage of your work is legwork and research as opposed to writing and dreaming up ideas and storylines? And how do you get ideas for your books – do everyday things spark off a train of thought? All my books have drawn heavily on my real life experiences as a scientist. This has helped me in formulating storylines and creating plots and sub plots. You can safely say that work has inspired my writing. In fact it was in my forties that I started to write and since then have published ten books, all have been on the NYT Bestseller List. Your characters like Temperance Brennan – ho do you come up with their names? Oh I just liked the name. Who are your favourite writers, and why? Jeffery Deaver (Bone Collector), Ian Rankin and P.D.James (I spent her eightieth birthday with her). It’s too short a time to discuss each writer and how they influence me. What’s your impression of Bali (if here for the first time?). how do people back home regard Bali? Am here for the first time. It’s a very short trip but what I have seen of it so far is lovely. People back home don’t view Bali as a dangerous place…just too far to travel to! Do you think you could set a book here (and this is a spark for a new novel?!) A tropical murder mystery. Could be big. What are your thoughts on the Ubud Writers and Readers festival? Well this is my last leg of my book promotion tour of New Zealand and Australia and I arrived with my daughter on the 29th and the festival closed on the 30th. Pity. But I enjoyed myself meeting other writers. Can’t say more. How do you compare it with similar festivals around the world? It is small and concise. There was much interaction between writers at the UWRF unlike many other festivals across the world that have an impersonal feel. That’s what I liked about it. From initial idea to typing the final work, what’s the average length of time it takes you? One year per book. Ten years ten books! Do you think people are as interested in books these day as they used to be? Has someone like J.K.Rowling helped the industry enormously? Yes yes very much so. Infact she has done a great service to the publishing industry and has been instrumental in helping in the revival of interest in books by children with her Harry Potter series. In your line of forensic work what incident do you still recall with emotion? When I was part of the team exhuming mass graves in Guatemala and this mother came up to me and held my hand. Her children and grandchildren were in the mass graves. It was moving. From real life to print and now to reel life? Tell us about your TV series? Hah its very exciting to see one’s work enacted on the screen. 20th Century Fox and Sky are broadcasting the TV series “Bones”. I am the producer and I also advise the panel of writers. In your latest book Bones to Ashes what is it that inspired you? The plot is based on a true story of a child’s skeleton found on the border of Brunswick and Quebec. I worked on that case. However, the parents or family members were never located. It still remains a mystery. Are you working on any book presently? Yes, the working title is Devil Bones, it is based on Voodoo, Black Magic and Witchcraft.